Chicken Fajita Foil Packets are the perfect easy & healthy meal for summer grilling, camping, and cookouts. Best of all, they’re loaded with all your favorite Tex Mex flavors and make a low carb, paleo, and keto friendly meal. Grilling season is finally here so it’s the return of foil packet dinners around here. Foil pack meals are ALL the rage right now. They are just so darn simple to put together with practically no clean up. The last thing most of us want is to be stuck indoors when it’s nice outside. 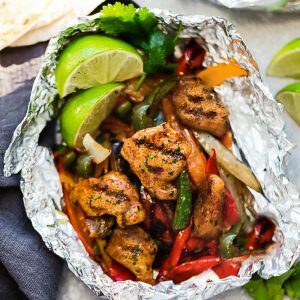 This recipe for Chicken Fajita Foil Packet is the perfect easy dinner recipe to have in your back pocket for summer. It’s got all those favorite Tex Mex flavors we love from our local Mexican restaurant. Foil packets are so convenient for summer and you can’t beat how easy they come together. You get a complete all in one meal and you can customize them with whatever sides you like. If you’re looking for a hearty and more filling meal, you can serve these Chicken Fajita Foil Packets with rice or even some potatoes for extra carbs. And you can even swap out the protein and veggies in here. Not a fan of chicken? Use steak or shrimp instead. 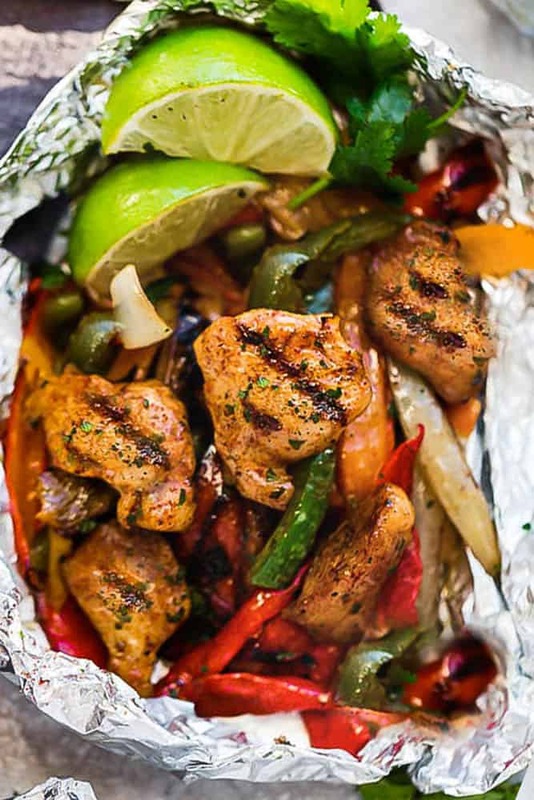 Another great thing about these Chicken Fajita Foil Packets is that they are low carb, paleo and keto friendly – perfect for swimsuit season! But if you’d rather have a heartier meal (like say for a camping trip), you can certainly add some black beans, cheese and even some rice to bulk them up. Start off by mixing together the chili powder, cumin, smoked paprika, garlic powder, salt and black pepper. If you have a favorite brand of fajita seasoning, you can certainly use that instead. Slice up the chicken into thin pieces or chunks and divide onto four (double layered) 18 x 12 sheets of foil (or you can also add a layer of parchment paper inside the foil if you prefer using parchment paper instead). Sprinkle with half of the seasoning mix. Cut your vegetables and arrange around the chicken. Drizzle with olive oil and the remaining seasoning. Finally, wrap up in foil and bake or grill to tender perfection. (Add beans, rice or cheese if desired). Serve with warm tortillas, avocado, an extra splash of lime juice and sprinkle with cilantro. For a low carb, keto version, you can use these low carb tortillas, coconut wraps, or serve over some lettuce or cauliflower rice. CAN I MAKE THESE CHICKEN FAJITA FOIL PACKETS AHEAD OF TIME? Yes, absolutely. These Chicken Fajita Foil Packets would be perfect for meal prep Sunday. 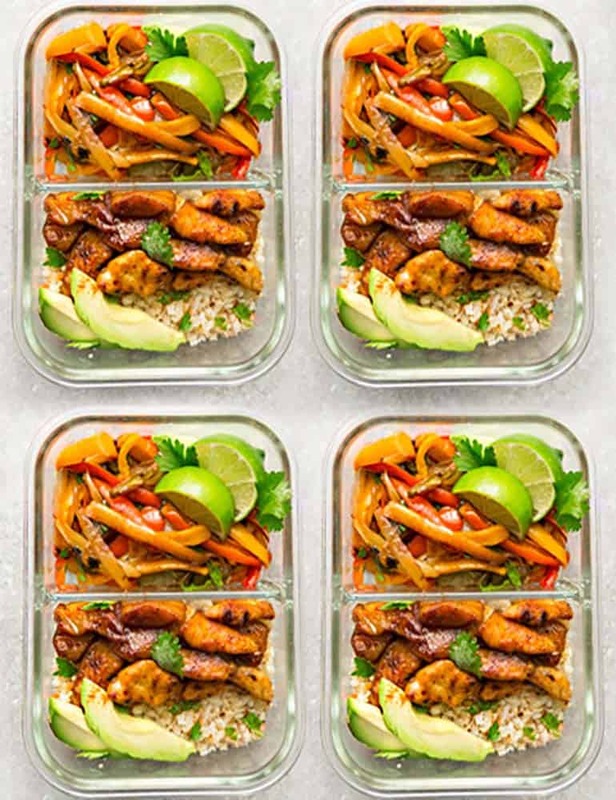 Just divide everything out into lunch containers (shown below with cauliflower rice) to enjoy them throughout the week. 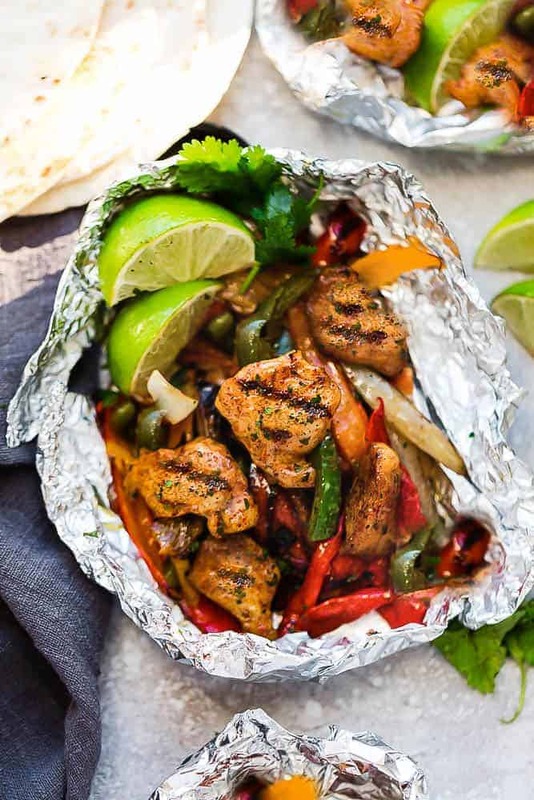 Chicken Fajita Foil Packets are the perfect easy meal for summer grilling and cookouts. Best of all, they're loaded with all your favorite Tex Mex flavors and make a low carb, paleo, and keto friendly meal. Cut eight 18 x 12 inch squares of foil* and lay out on a flat surface. Divide into four piles where each foil packet has two pieces. Combine the seasonings in small bowl and mix. Place the chicken in the middle of each piece of foil. Sprinkle with half of the seasoning and toss to combine. Cut the vegetables into thin strips and divide evenly into each packet, arranging them around the chicken. Drizzle the chicken and vegetables with olive oil, lime juice and sprinkle the vegetables with the remaining seasoning mix. Serve with warm tortillas with sliced avocado and your favorite toppings. Place foil packets on a baking sheet and cook for 25-30 minutes (or until chicken is cooked through, rotating tray once). Time varies depending on the thickness of the chicken. Remove baking sheet from oven. FOR LOW CARB: Serve in low carb tortillas, over salad or cauliflower rice. FOR MEAL PREP: Divide into lunch containers over cauliflower rice and wrap tortillas separately. Made This Recipe for company last week-end. The chicken Fajitas received 5 stars from our guests! I Rate it a 10! Making them again tonight with cilantro, lime cauliflower rice! Stellar recipe! Thanks so much for Posting!